Karl Barth was educated in the liberal Protestant approaches to Christianity. But the uncritical support of World War I by leading German intellectuals, including some of his teachers, disillusioned him and he started to question the liberal theology and its roots that stemmed from the Enlightenment. Later in his life Barth gained an overwhelming conviction about the victorious reality of Christ’s resurrection. This conviction became both the starting point and the bedrock of Barth’s theology. Barth believed that Christian theology should derive its entire thinking about God, man, sin, ethics, and society from what can actually be seen in Jesus Christ as witnessed by the Old and New Testaments rather than from sources independent of this revelation. In his study Karl Barth kept a copy of the crucifixion painting of the Isenheim altar of Matthias Gruenwald with John the Baptist. Barth often used this painting as an example of how a theologian should work: He should look at the finger of John with which he points toward Christ, and he should remain true to the mission of proclaiming Jesus Christ. As he pastored, he noted with alarm that Germany was becoming increasingly militaristic and that his former professors were supportive of this. Barth, dismayed with the moral weakness of liberal theology, plunged into a study of the Bible, especially Paul’s Epistle to the Romans. He also visited Moravian preacher Christoph Frederick Blumhardt and came away with an overwhelming conviction about the victorious reality of Christ’s resurrection—which deeply influenced his theology. Out of this emerged his Commentary on the Epistle to the Romans (1919). He sounded themes that had been muted in liberal theology. Liberal theology had domesticated God into the patron saint of human institutions and values. 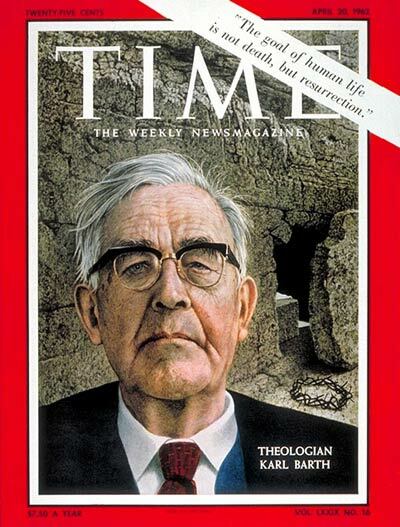 Instead, Barth wrote of the “crisis,” that is, God’s judgment under which all the world stood; he pounded on the theme of God’s absolute sovereignty, of his complete freedom in initiating his revelation in Jesus Christ. The first of six heavily revised editions followed in 1922. It rocked the theological community. Barth later wrote, “As I look back upon my course, I seem to myself as one who, ascending the dark staircase of a church tower and trying to steady himself, reached for the banister, but got hold of the bell rope instead. To his horror he had then to listen to what the great bell had sounded over him and not over him alone.” Liberal theologians gasped in horror and attacked Barth furiously. But Barth had given that form of liberalism a mortal wound. Dietrich Bonhoeffer was a theologian, a pastor, a spiritual writer, a musician, and an author of fiction and poetry. The integrity of his Christian faith and life, and the international appeal of his writings, have received broad recognition and admiration, all of which has led to a consensus that he is one of the theologians of his time whose theological reflections might lead future generations of Christians into creating a new more spiritual and responsible millennium. But Bonhoeffer also realized that Nazism posed a very different challenge for the churches, and it was here that he broke new ground. The church was not just being called to clarify its attitudes toward Judaism and the people of Israel, he noted. The real question was how the church would judge and respond to the Nazi state’s actions against the Jews. On this point, Bonhoeffer was explicit about the church’s obligations to fight political injustice. The church, he wrote, must fight evil in three stages: The first was to question state injustice and call the state to responsibility; the second was to help the victims of injustice, whether they were church members or not. Ultimately, however, the church might find itself called “not only to help the victims who have fallen under the wheel, but to fall into the spokes of the wheel itself” in order to halt the machinery of injustice. His return to Germany in July 1939 marked a new stage in his life: active resistance. Virtually the only man in a position to do so, Bonhoeffer became the crucial link between international ecumenical efforts and the German conspiracy against Nazism. The Dohnanyi/Canaris effort, termed “Operation Seven,” eventually spirited fourteen Jews out to Switzerland (eleven had converted to Christianity; three had not). Bonhoeffer used his ecumenical contacts to arrange visas and sponsors for the group. 19 At his instigation, one of those rescued was Charlotte Friedenthal, who had worked with Marga Meusel and with the Grüber office. The Gestapo report on Bonhoeffer described him as “completely in the opposition.” Still, even after the failure of the July 20, 1944, attempt to kill Hitler, it was months before the Nazis realized the extent of Bonhoeffer’s involvement in resistance circles.